“Bravo!” to Lydia Woodroff for spotting this ‘bellissimo’ bra shop in Reading, Berkshire UK. It’s a bit too easy, isn’t it? Like shooting fish in a barrel. Reminds me of a River Murray speedboat in the 1980s. When Top Punter Janet O’Brien sent this in, even she admitted it was far from her best work. But I’m going to post it as a ‘watch-out’. I think we can all do better. Mt. Gambier, SA. 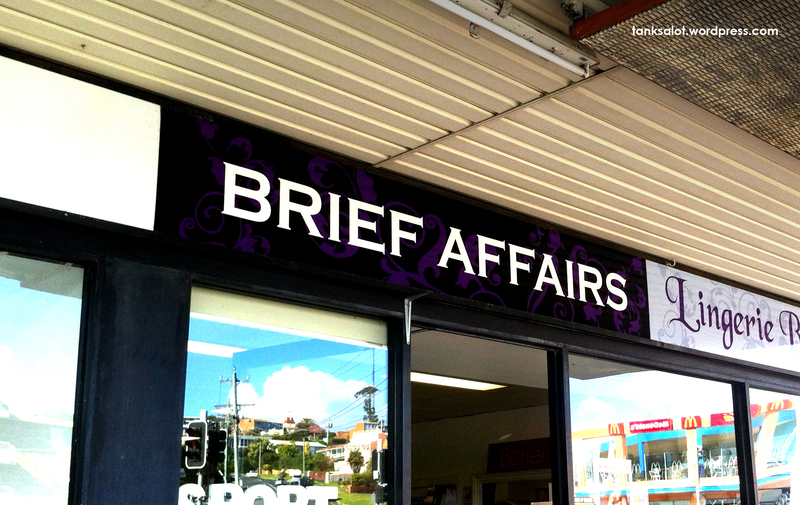 This lingerie shop in Merimbula NSW is all about keeping things brief. The underwear, the amount of time it’s worn and ultimately, the affairs themselves. Found in Wentworthville NSW by Chloe and Archie… I might have to personally go and confirm this Pun Shop Name. You know, just to be sure. Something about this Pun Shop Name caught Simon O’Brien’s eye. Found in Hilton, South Australia.